In certain cases of spinal injury and disc damage, the expert back surgeons at ProMedSPINE may opt to perform laser spinal surgery. Less invasive than traditional spine surgery, laser spinal surgery is a great option for patients who want to alleviate their leg and/or back pain without undergoing open surgical procedures. To find out if you are a candidate, please contact ProMedSPINE today! 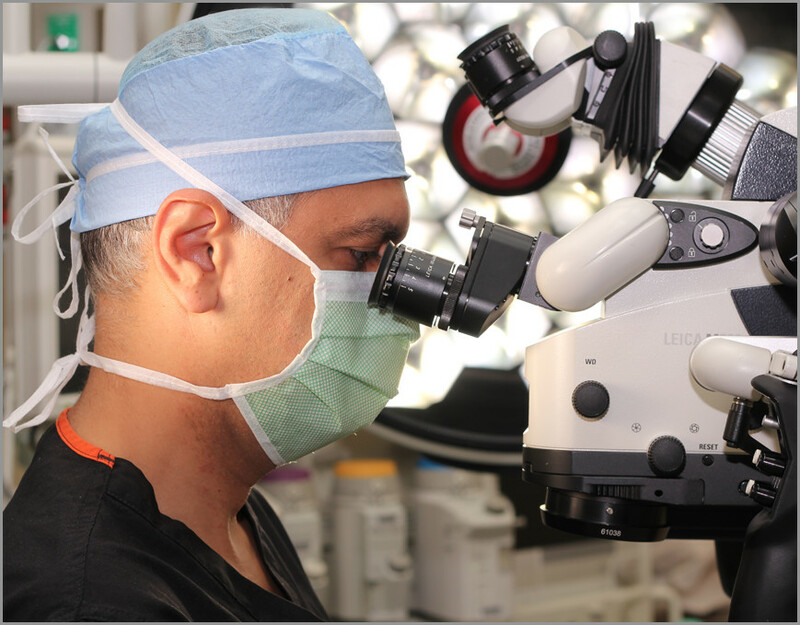 As board-certified neurological surgeons, Dr. Gravori and his team believe in an individualized approach to patient care and perform microscopic and endoscopic techniques whenever possible to minimize side effects and expedite healing. To that end, we at ProMedSPINE offer laser spinal surgery for patients suffering from bone spurs, herniated discs, spinal stenosis, and a variety of other back problems and conditions. If you are suffering from pain or limited functionality, contact ProMedSPINE to find out how we can help. This minimally invasive outpatient procedure can generally be performed under local anesthetic. Before your procedure, Dr. Gravori and the rest of the team will take a complete health history and answer all of your questions. During spinal surgery, your experienced surgeon will utilize a laser (focused light beam) in place of a scalpel to create a small incision that is usually less than an inch in length and cut away injured tissue. He will then employ computerized navigation and utilize the latest advances in nerve monitoring technology, ensuring that soft tissues remain unharmed. Unlike open spine surgery, endoscopic techniques enable surgeons to separate the muscles rather than cut through them. Patients who undergo this procedure can return home the day of their surgery and resume many of their daily activities like walking and exercising within just a few hours. Read further for WebMD’s article on back surgery. The benefits of this procedure include an expedited recovery time, less blood loss, low risk of infection, increased post-surgery mobility and minimal incisions. Additionally, the smaller incision reduces the amount of tissue being damaged and helps speed up healing. Finally, patients who undergo laser spinal surgery avoid the small risk associated with general anesthesia. Not everyone is a good candidate for this procedure. Patients with certain conditions, including arthritis, may not benefit from laser treatments. One of our expert surgeons will assess the patient’s overall health along with factors like the underlying cause of back pain and location of nerve compression. However, laser spinal surgery can help many patients resume living lives that are free from pain. A spine condition can have a significant impact on your quality of life as well as your long-term health and mobility. If you’re suffering from spine pain, it’s important to contact an expert surgeon to determine the best method of treating your condition. Contact ProMedSPINE at one of our three locations (Beverly Hills, Encino, and Valencia) to schedule a consultation to see what the right method for you is, to receive a second opinion, or to dispel any spine surgery myths you might have. Our goal is to reduce pain and improve quality of life for all of our patients. Contact our back pain relief center today! Next, learn more about spinal pain. Traditional, open spinal surgery requires a long incision in the back that has a higher risk of complications. Our experienced back doctors are committed to treating each patient with the least invasive procedures possible. This means smaller incisions, less bleeding, minimal scarring, and a much shorter recovery time than traditional procedures. When patients undergo minimally invasive spinal surgery, the area treated is significantly reduced and patients do not need extended stays in the hospital to recover. In fact, some patients are able to return home the same day! Unfortunately, in some cases patients may complain of continued pain even after undergoing surgery. However, these cases are the exception and not the rule. Patients who have a negative experience with a surgical procedure are going to be the most vocal and their experiences can often drown out the many people who have very positive experiences. If someone is experiencing pain even after surgery it is likely that they either received the wrong type of procedure or surgery was not necessary in the first place. It is important for patients to visit a doctor with years of training and experience in accurately diagnosing spinal conditions so that patients only receive the necessary treatment. When performed correctly by an expert, surgical treatments can alleviate chronic pain.